Below we have created a quick and short overview of the EU regulations in relation to safety footwear. The European standard for Safety footwear is provided by the International Organization for Standardization provides . The current one is ISO 20345:2011 – previously ISO 20345:2004. What are the demands on safety shoes? What does the law say? Safety shoes, also known as protective footwear, is a footwear with a re-enforced toecap and, possibly, additional protective features. The law in EU prescribes that safety footwear should be CE-certified and appropriate for use under the work conditions and possible risks at the workplace. In order to determine the right model, you have to know the difference between several CE certifications standards. What is S1, S2 and S3? Within the safety shoe area there are three general CE-certifications: S1, S2 and S3. The CE-certifications are created to give a quick overview of safety features of the desired pair of safety shoes. S1, S2 and S3 all include: toecap, closed tread, energy absorption, oil-resistant outsole and anti-static features. Which certifications does the AIRTOX models meet? 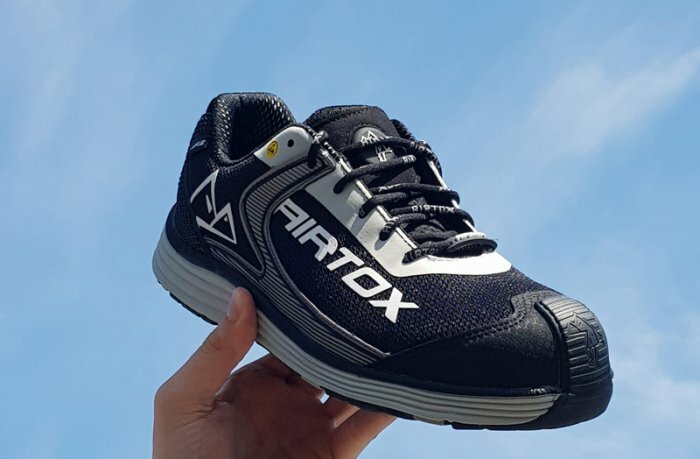 All AIRTOX safety shoes are CE-certified and comply with all legal requirements and rules regarding safety and protective footwear, as they are all marked with the European norm EN ISO 20345. All AIRTOX safety shoes have a toecap and an anti-penetration layer, while MR2, MR3 and the S-series are certified with a S1-P standard. The P stands for anti-penetration layer, SRC indicates that the shoes are slip resistant and ESD indicates that they are anti-static. To keep your feet safe and comfortable, chose a pair of AIRTOX that matches your needs.